realXtend speeds up the development of the global standardized 3D internet of virtual worlds by making the best technology available to everyone, and entirely free of charge. The true value of the interconnected 3D worlds is in the applications, not the platform. You can create own networked multiuser 3d applications using realXtend as a base. Royalty-free, no strings attached, suitable for business. Pre-existing open source components and Internet standards are used when suitable, and new are created as needed. the realXtend foundation, which ensures the existence (owns and protects the name) and can be used for funding (the foundation can receive donations, and allocate them to realXtend development based on association’s recommendations). The actual development work is mostly done in projects in the different companies and other organizations. realXtend is the collaboration to continuously develop the common platform on which applications are built. realXtend technologies are now available also as part of the EU FIWARE Open Source offering in the WebUI chapter. For multi-user applications Tundra is used as the server also for the WebTundra client. It is mature and in commercial use as the base for the MAPGETS service and in the Finpeda Virtual Space product. Tundra-Urho3D is a new native (C++) implementation using the open source Urho3D engine. This Urho3D based Tundra does not use Qt for the UI but is smaller and lighter. Urho is also suitable for iOS and Android mobile clients / applications. realXtend technologies are not limited to virtual worlds but can be used for many kinds of applications. Here the term ‘virtual world’ refers to the bag of functionality that people expect from a complete virtual world system such as Second Life ™. realXtend does not currently provide a complete virtual world solution (a Second Life clone), with authentication, avatar editing, simple world creating tools, inventories, virtual currency, social groups etc. We emphasize ease of integration to existing systems: both to Internet services and internal e.g. corporate backends. Instead of coming up with realXtend-specific authentication, typically it is better to use e.g. OpenID (Google, Facebook etc. accounts) or whatever your organization is already using (e.g. LDAP). Or just provide anonymous service which is typical for websites. Assets (i.e. 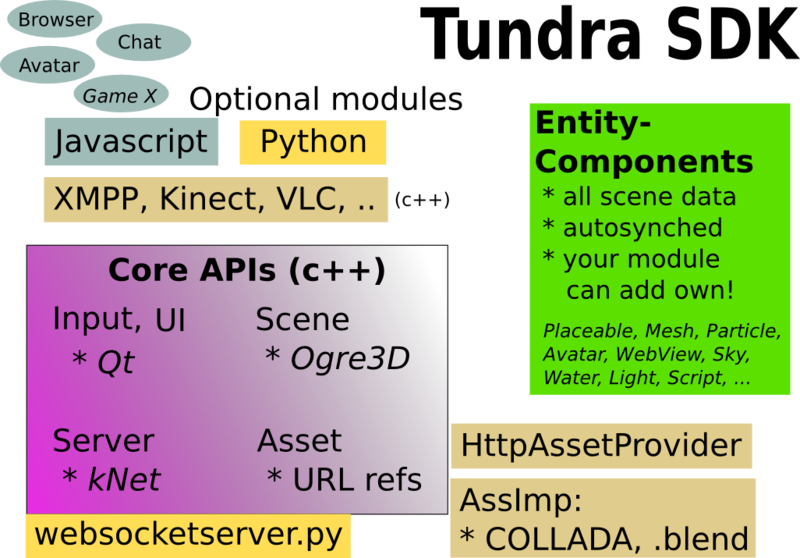 data files such as meshes and textures) can be put to normal web servers, special Second Life style inventory systems are often not needed. However, the original inspiration for the initiative is from Second Life (http://www.ugotrade.com/2008/04/03/realxtends-vision-for-open-virtual-worlds-interview-with-juha-hulkko/). Several realXtend applications and business ideas share a lot with virtual worlds and some realXtend people advocate the so-called 3D Internet etc. It is possible that a distributed Internet wide new open source & standard Second Life like thing emerges from these efforts. The Hypergrid system with Opensimulator is approaching it from a different angle. We discuss constantly with Opensimulator people about possible cross-compatibility and interoperability. Welcome to the realXtend community! I am very happy to be part of new world.